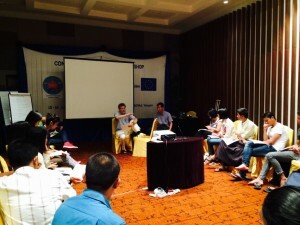 CPCS believes in the long term accompaniment and support of a myriad of actors including governments, armed groups, civil society networks and groups, political parties and politicians, academic institutions, thinktanks, International Non-Governmental Organisations, Embassies and other regional players including business actors. Relationships are built and fostered through CPCS analysis of the driving factors of a given conflict, our accessibility to various actors, their level of trust in us and our partners, and the possibility of real impact and change through engagement. CPCS believes that including armed groups in conflict transformation processes and investing in the creation of a culture of peace among these organisations is essential to sustainable positive change. In our work with armed groups, we aim to transform their focus from violent struggle to meet their demands to one of dialogue and negotiations. To this end, CPCS supports armed groups in the development of more effective negotiations skills and encourages cohesive leadership, creating safe and conducive spaces for dialogue and critical reflection and facilitating exposure visits of key players to other conflicts contexts to expand their comparative knowledge in the transition from conflict to peace. CPCS’ interventions with governments are based on a change theory that stipulates the bureaucracy or civil service should have the capacity to actively support and sustain peace processes. Our initiatives aim to help government employees and decision-makers gain conceptual and practical understanding of peacebuilding theories and strengthen the capacity of government representatives to support peace processes. We also provide knowledge and practical skills relating to themes deemed most relevant in the local conflict context. As part of our overall effort to strategically develop the skills of conflict actors in post-conflict societies, we aim to strengthen the capacities and knowledge of civil society groups in the area of conflict transformation. We also seek to contribute to more unity among leading voices in conflict-affected societies, including media, by strengthening their connections and collaborative efforts, with the overall goal of contributing to the establishment of lasting sustainable peace.